Sky Digital: Nieuwe frequentie voor More 4: 10936.00MHz, pol.V (DVB-S SR:22000 FEC:5/6 SID:8340 PID:2359/2361 nar,2360 English- FTA). Sky Digital: Nieuwe frequentie voor More 4: 10714.25MHz, pol.H (DVB-S SR:22000 FEC:5/6 SID:9231 PID:2322/2324 nar,2323 English- VideoGuard). Sky Digital: Nieuwe FEC voor More 4 op 12304.00MHz, pol.H: FEC:5/6 ( SR:27500 SID:12030 PID:2336/2337 English,2338 nar - VideoGuard). Sky Digital: Nieuwe frequentie voor More 4: 12304.00MHz, pol.H (DVB-S SR:27500 FEC:2/3 SID:12030 PID:2336/2337 English,2338 nar- VideoGuard). More 4 switched to Astra 2E satellite at 10729.00MHz, pol.V (DVB-S , 10729.00MHz, pol.V SR:22000 FEC:5/6 PID:2359/2360 English,2361 English). More 4 switched to Astra 1N satellite at 10729.00MHz, pol.V (DVB-S , 10729.00MHz, pol.V SR:22000 FEC:5/6 PID:2359/2360 English,2361 English). Sky Digital: PID zijn veranderd voor More 4 op 10729.00MHz, pol.V: PID:2359/2360 English,2361 English SID:8340 ( SR:22000 FEC:5/6 - FTA). Sky Digital: PID zijn veranderd voor More 4 op 10729.00MHz, pol.V: PID:2369/2370 English,2371 English SID:8340 ( SR:22000 FEC:5/6 - FTA). Sky Digital: PID zijn veranderd voor More 4 op 10729.00MHz, pol.V: PID:2379/2380 English,2381 English SID:8340 ( SR:22000 FEC:5/6 - FTA). Sky Digital: PID zijn veranderd voor More 4 op 10729.00MHz, pol.V: PID:2363/2364 English,2365 English SID:8340 ( SR:22000 FEC:5/6 - FTA). Sky Digital: PID zijn veranderd voor More 4 op 10729.00MHz, pol.V: PID:2361/2362 English,2363 English SID:8340 ( SR:22000 FEC:5/6 - FTA). Sky Digital: Nieuwe frequentie voor More 4: 11565.00MHz, pol.V (DVB-S SR:27500 FEC:2/3 SID:50520 PID:2366/2367 English,2368 English- VideoGuard). 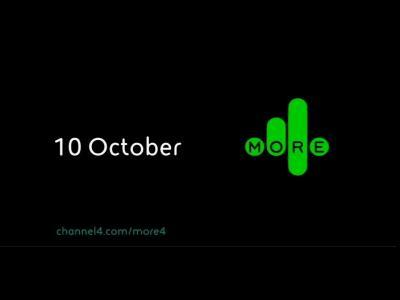 Sky Digital: More 4 (United Kingdom) momenteel ongecodeerd (FTA) te ontvangen (10729.00MHz, pol.V SR:22000 FEC:5/6 SID:8340 PID:2357/2358 English,2359 English). Sky Digital: PID zijn veranderd voor More 4 op 10729.00MHz, pol.V: PID:2357/2358 English,2359 English SID:8340 ( SR:22000 FEC:5/6 - VideoGuard). Sky Digital: PID zijn veranderd voor More 4 op 10729.00MHz, pol.V: PID:2353/2354 English,2355 English SID:8340 ( SR:22000 FEC:5/6 - VideoGuard). Sky Digital: PID zijn veranderd voor More 4 op 10729.00MHz, pol.V: PID:2365/2366 English,2367 nar SID:8340 ( SR:22000 FEC:5/6 - VideoGuard). Sky Digital: PID zijn veranderd voor More 4 op 10729.00MHz, pol.V: PID:2362/2363 English SID:8340 ( SR:22000 FEC:5/6 - VideoGuard). Sky Digital: More 4 (United Kingdom) is in DVB-S van start gegaan op 10729.00MHz, pol.V SR:22000 FEC:5/6 SID:8340 PID:2361/2362 English - VideoGuard. Sky Digital: More 4 is testing in DVB-S VideoGuard on 10729.00MHz, pol.V SR:22000 FEC:5/6 SID:8340 PID:2361/2362 English.